Site of 1820 trading post of Jesse Burnam. His ferry on the Colorado River helped Gen. Sam Houston reach San Jacinto, 1836. To cut off Santa Anna, Houston then burned post and ferry. 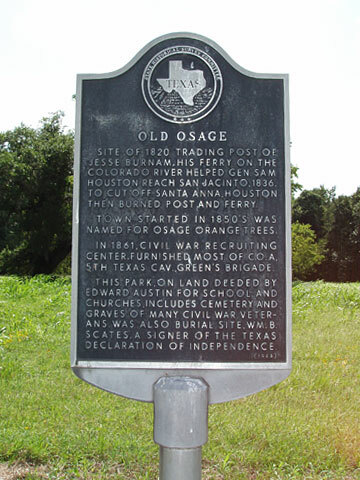 Town started in 1850s was named for Osage orange trees. In 1861, Civil War recruiting center. Furnished most of Co. A, 5th Texas Cav., Green's Brigade. This park, on land deeded by Edward Austin for school and churches, includes cemetery and graves of many Civil War veterans. Was also burial site, Wm. B. Scates, a signer of the Texas Declaration of Independence.